AirTrain – a monorail type train that connects JFK’s terminals with the subway (A, E, J to Manhattan) and Long Island Rail Road. Trains run approximately every 10 minutes. 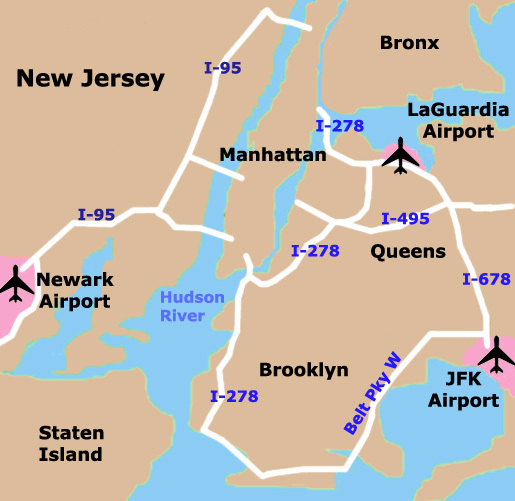 The total journey to/from Manhattan usually takes about an hour (reduced subway service at off-peak hours, weekends and holidays will increase travel time). Still, at $7.25 ($13.75 on LIRR) it’s a real bargain and the best alternative for times when traffic is a factor. More information here. 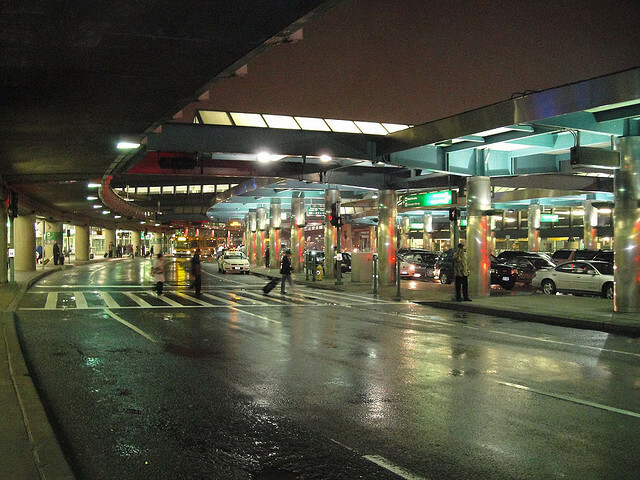 NYC Airporter – express bus service to/from Grand Central Terminal and Port Authority Bus Terminal. Buses leave 5am – 11:30pm, every 15 minutes 11am – 8pm, and every 30 minutes other times. Cost $15 ($28 roundtrip) and tickets can be purchased online or when boarding. Curbside agents (wearing the Airporter logo) can be found outside the baggage area at each terminal. See their website for information. 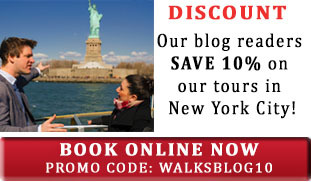 Taxi – there is a Flat Fare of $45.00 for trips to/from Manhattan (excluding bridge or tunnel tolls and tip). This is the entire fare (not per person) and taxis can seat up to four passengers. Taxis now accept credit cards. Join an official taxi line outside the baggage area (rogue taxis/drivers are a riskier option). Get a receipt when you arrive at your destination (you’ll need the medallion number if you’ve left something in the cab). Private Car Service – cost begins at $40. (excluding tolls and tip) for a basic Sedan. Minivans and Limousines are available at higher costs. Note: “Wait times” can really add to the cost of your trip. Recommended companies are Carmel (866) 666-6666 and Dial 7 (212) 777-8888. Like taxis, this can be an economical option for two or more travelers. AirTrain Newark – another monorail train that connects with NJ Transit trains to Manhattan’s Penn Station (as well as PATH trains for NJ and Amtrak). AirTrain runs every 3 minutes 5am -12am, and every 15 minutes other hours. NJ Transit trains leave consistently (except 2am – 5am when there is no service) and the journey to Manhattan is 30 minutes. Tickets are $12.50. See their website for exact schedules and information. Newark Airport Express – express buses between EWR and Manhattan (Port Authority, 5th Ave. & 42nd St., and Grand Central Terminal) 4am – 1am. (4:45am – 1:45am to EWR). Buses depart every 15 minutes 6:45am – 11:15pm (30 mins other hours) and tickets are $15 ($27 roundtrip). See their website for information or to buy tickets online. Supershuttle – Shared van service costs $20 from EWR to your hotel/destination. Must be reserved in advance. See information above or their website. Taxi – taxi fares to/from Manhattan are metered and range $50-$70, not including tolls and tip. There is an additional $5 surcharge weekday mornings (6-9am), afternoons (4-7pm) and weekends (12-8pm). Again, join an official taxi line outside the baggage area, and get a receipt when you pay. For more information, go here. Private Car Service – cost begins at $43. (excluding tolls and tip) for basic Sedan. Minivans and Limousines are also available at higher costs. Note: “Wait times” can really add to the cost of your trip. Recommended companies are Carmel (866) 666-6666 and Dial 7 (212) 777-8888. Like taxis, this can be an economical option for two or more travelers. M60 Bus – This NYC bus runs from Broadway & 106th St directly to LGA, connecting with subway lines 1,2,3, 4,5,6, A, B, C, D for the cost of a standard ride: $2.25. Buses run every few minutes (less nights and weekends) and the trip takes approx. 30 minutes from beginning to end. The bus can become very crowded with New Yorkers and luggage-toting travelers squeezing in together. Still, it’s an incredible deal. 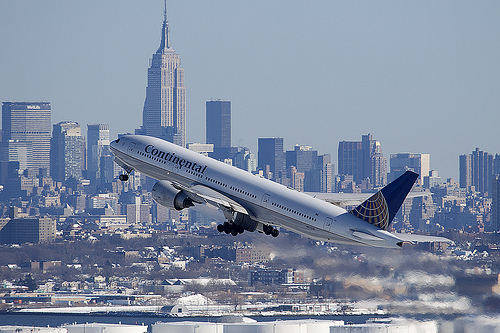 NYC Airporter – express bus service to/from Grand Central Terminal, Port Authority Bus Terminal, and Penn Station. Buses leave 5am – 11:30pm, departing every 30 minutes. Cost $12 ($22 roundtrip) purchased online or when boarding. Curbside agents (wearing the Airporter logo) can be found outside the baggage area at each terminal. See their website for information. Supershuttle – Shared van service costs $15 and must be reserved in advance. See Supershuttle information above, or their website. Taxi – taxi fares are metered to/from Manhattan and range $21-$30, not including tolls and tip. There is an additional surcharge of $1.00 during peak hours (4-8pm) and .50 nights (8pm-6am). There are Ground Transportation Counters outside the baggage areas who can direct you to the official taxi line. For more information, go here. Private Car Service– cost begins at $28. (excluding tolls and tip) for basic Sedan. Minivans and Limousines are also available at higher costs. Note: “Wait times” can really add to the cost of your trip. Recommended companies are Carmel (866) 666-6666 and Dial 7 (212) 777-8888. Like taxis, this can be an economical option for two or more travelers. Driving – there are several rental car agencies at each airport, but driving in the city can be challenging, and parking very expensive. Public Transportation is highly recommended.